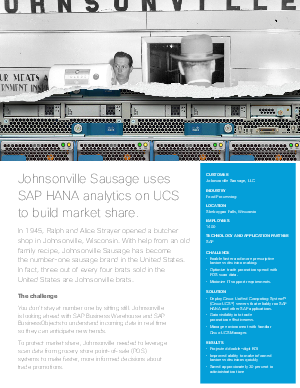 Johnsonville Sausage uses SAP HANA analytics on UCS to build market share. In 1945, Ralph and Alice Strayer opened a butcher shop in Johnsonville, Wisconsin. With help from an old family recipe, Johnsonville Sausage has become the number-one sausage brand in the United States. In fact, three out of every four brats sold in the United States are Johnsonville brats.